The Firearms, Weapons and Explosives title examines the Firearms Act in its entirety. The Fires title examines the regulatory framework for the use and prevention of fires in Canada. 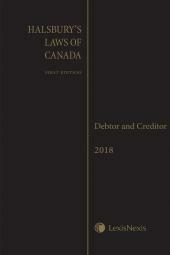 The Food title examines the business law relating to the preparation, sale and marketing of edible substances in Canada. The Gifts title examines the requirements necessary to create a valid gift. 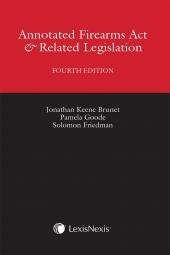 Begin updating your law library today! 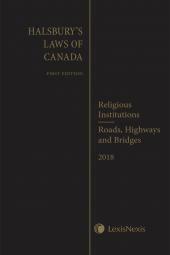 $135* per volume (ISBN: 9780433454946) OR purchase individual volumes at $310 each. *Per volume with commitment to purchase the entire 72-volume set. Justice Jonathan Keene Brunet, B.A., LL.B. In Canada, ownership and use of firearms, weapons and explosives are subject to regulation under municipal bylaws, provincial and federal statutes, and regulations. In addition to regulatory controls, criminal sanctions are imposed against persons who violate Criminal Code and Firearms Act provisions with respect to failing to use and register weapons as required. Erin A. MacKenzie, B.Sc., LL.B., M.B.A.
Dr. Donald Buckingham, LL.B., Dip. Int. Law, LL.D. Catherine Morin, B.Mus. (Hons. ), LL.B. Erin A. MacKenzie, B.Sc., LL.B., M.B.A., attended law school at Queen's University where she won several academic awards including the Osgoode Society for Legal History Prize and the McCarthy Tétrault LLP Prize for high academic standing. She practiced law as a litigation associate at the Toronto law firm of McCague Peacock Borlack McInnis & Lloyd LLP, until 2008. Her practice focused on serving the firm's corporate and commercial clients, and included counsel work on complex commercial and environmental matters. In 2009, she obtained her Masters of Business Administration from the Richard Ivey School of Business, where she graduated on the Dean's Honour List. She is currently a management consultant in the Toronto office of an international consulting firm. The Hon. Jonathan Keene Brunet, B.A., LL.B., is a judge of the Ontario Court of Justice and a lecturer at the Law Faculty of the University of Ottawa, the Law Department of Carleton University and the Ontario Bar Admission Course. Donald Buckingham, LL.B., Dip. Int. Law (Cantab. ), LL.D., has been a private lawyer, law professor, government legal counsel, administrative judge, and consultant in the areas of agricultural law, food law and international trade in agricultural and agri-food products for the past 30 years. He is currently President and Chief Executive Officer of the Canadian Agri-Food Policy Institute (CAPI) and from 2009 to 2017 was Chairperson of the Canada Agricultural Review Tribunal (CART), both of which are located in Ottawa. Passionate about the various aspects of agriculture and food since he was a child growing up on a northwest Saskatchewan farm, Dr. Buckingham pursued his Bachelor of Arts degree at the University of Saskatchewan in French and Philosophy. Halfway through his degree, he travelled to Senegal to work on an agriculture and reforestation project, which led him later to complete a master's degree in development studies at the Université de Liège in Belgium. He then went on to complete his Bachelor of Laws degree at the University of Saskatchewan, his master's law degree at the University of Cambridge and his Doctor of Laws/Docteur: Droit Public degree jointly from the University of Montpellier 1 in France and the University of Ottawa. Dr. Buckingham has taught full-time and part-time at several law schools across Canada (Western, Saskatchewan and Ottawa), in Europe (Montpellier 1) and in Africa (Stellenbosch). His areas of professional interest are wide and varied and include agricultural law and policy, food law and policy, the public regulation of food and agriculture, the international trade of agriculture and food products, environmental law, food and beverage labelling law, the law of sustainable development, administrative law, evidence law and tort law.